The Benicia Police Officers' Association has set up this go fund me page to collect donations and fundraise on behalf of Jourdan Duncan. Jourdan is an impressive 18 year old who walks almost 5 hours a day to and from work so he can raise money to fix his car and pay for college. Jourdan also has aspirations of becoming a CHP officer one day. 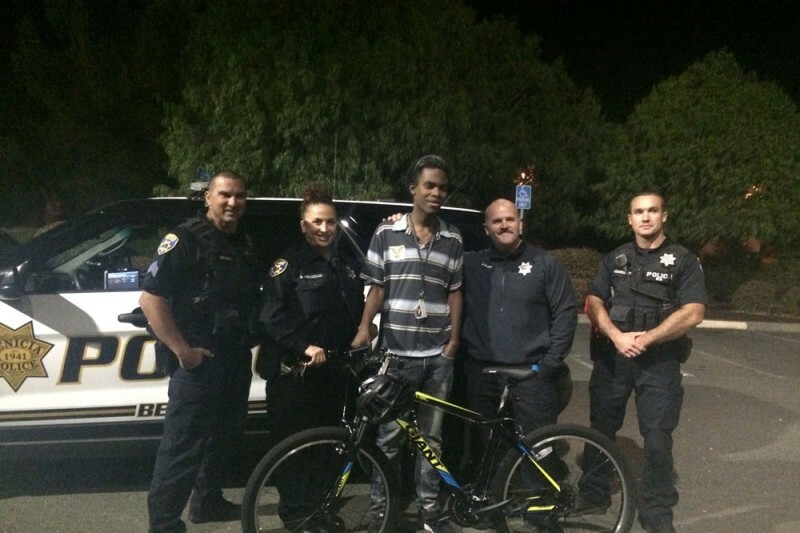 Benicia PD Corporal Kirk Keffer met Jourdan walking alone one night and learned about his story. Impressed with Jourdan's work ethic and commitment to his dreams, Cpl. Keffer reached out to the Benicia Police Officers' Association and asked if there was something they could do to help out this young man. The BPOA agreed to purchase a bicycle for Jourdan. Since this meeting the Benicia Police Department and Police Officers' Association has been approached by many community members from across the United States offering to donate to Jourdan and help him make his dreams a reality. Jourdan and Cpl. Keffer's story has gone viral and touched many across our Country. Please consider making a donation to Jourdan. See the links below for more on Jourdan's story. Thank you to everyone who has donated to help Jourdan. We have been overwhelmed with the response from the community and how quickly our initial goal of $5,000 was reached. We continue to receive interest in helping out Jourdan. We raised the goal to $10,000 and quickly surpassed the goal with continued donations coming in. We have now raised the goal to $50,000 with hopes that Jourdan can use this gift to help him achieve his dreams beyond fixing his car. Fund his educational aspirations and dreams. Again thank you from the Benicia Police Officers' Association. The Benecia Police Department has captured my heart. Thank you!! God is good, this is proof. Together we can do so much. Nice to see a police office take the time to help this man build a better future. God bless all of you, keep up the good work! Young man...you're an inspiration to your generation. Your commitment to hard work and persistence is amazing. I'm sharing this with my own children. Thanks BPD for recognizing Mr. Duncan and helping him out. I saw this story on CNN yesterday. I am so touch by this story and the compassion that this officer as shown to Jourdan. I am so proud of this young man's strength and will power to earn an honest living and wanting to go to college even as he faces adversity. Hoping he will have a brighter future with the help he is receiving! Don't ever give up Jourdan!! It takes a village..We are stronger together!! Apologies! Just found the note from The Benicia P.D. Great news! I want to live in THIS world! I cannot love this story enough! I'm so proud of this young man and so incredibly happy to hear how awesome Officer Keffer was to step in and help him. This is how it should be done folks, let's all just be kind to each other. It clearly can be done. Bravo! Thank u for your kindnesses to this young man! That's how we win in life! He'll always remember all of u and pass it on. Blessings to u all! If everyone gives a little it soon adds up! Wonderful young man! Wish you all the best! This touch my heart. That a young man so young, cares, and is responsible. He did't quit his job or give up. God Bless you. Thank you Benicia Police Dept. One act of kindness goes a long way. Any act of kindness wheter it small or large, doesn't go unnoticed. Have faith, always know that God is with you and he will never leave you. So glad to see the $10,000 goal is nearly reached....great job! Terrific about the new goal! Those of you who donate --- Please put this information on your Facebook page!